Hi, I’m so glad to have found you! 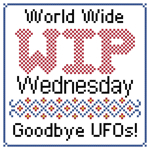 I will be posting my first WIP on Wednesday. My goal for 2012 is 500 hours of stitching so I can use all the motivation, lol! I’ve gotten over 2 hours of stitching in today! Thanks for the encouragement, I really need it!